Author of Optimize , Lee Odden is the master of developing curated conference ebooks. These ebooks are a classic example of epic curated content. 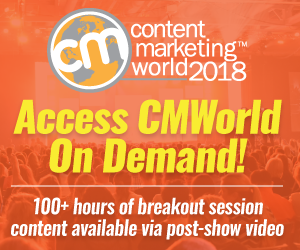 Epic curated content is a major content marketing effort that’s both original content and curated content because it’s co-created with participants. Beyond Content Marketing World, Odden has created epic curated content for Social Media Examiner and LinkedIn. Until the current Content Marketing World effort, Odden did all of the curated conference ebook work himself. Again, this is another common practice among thought leaders. They do the hard work until they create a replicable process. Classic Marketing Problem: Marketer finds a marketing or promotion that performs exceptionally well. Marketer continues to use the same promotion the same way again and again and again. Results: Diminished returns over time. Being the first person to try and succeed at a new type of marketing translates to greater success. Continuing to change and improve his epic curated content maintains and, even, improves results. These 2 tips are important lessons for every marketer! The secret sauce behind Odden’s epic curated content is old-fashioned marketing principles applied to influencers and curated content. To help you create epic curated content every time use these 10 steps. No matter what you’re planning to do, you must have a reason for doing it. KEY: Make sure your curated content is a win-win. You’re approaching stars you must answer WIIFM (aka: What’s in it for me?). Set short-term objectives. Decide what you want your curated content to achieve. Often it’s branding and event attention. Consider longer-term goals. Among these objectives are building your email list, branding, and sales. Make it easy to figure out which participants or influencers to contact and why they should engage. KEY: Have a 360° appreciation of everyone your content will touch. Know your influencers. Craft well-defined, easy-to-apply criteria for choosing participants. Know your target audience. This means having a set of well-developed marketing personas including social media personas for each target segment so that you can tailor your content and related information to them. Like any other major form of content, decide what type of epic content you’re going to create and what’s it going to be about. KEY: Tell a story at the heart your epic content. Stories make content unforgettable. Plan out the key points you want to make. Odden ensures that his ebooks correlate with the conference topics. Select a theme. The objective is to make the hook relevant and fun for both readers and participants. Lay out your editorial and promotional calendar for your epic curated content. It’s a big effort. You have to ensure that you’ve got all of the details nailed down. Odden has upped the ante with pre-launch promotion. While this activity could be considered part of step 3, it’s a key element that sets Odden apart from the pack. Continue to find new features to add. For example, Odden’s The Sophisticated Marketer’s Guide to LinkedIn includes longer interviews rather than a single question. Keep improving each aspect of the epic curated content to maximize results. Don’t stick with the old way of doing things. Look for ways to maximize your results. The secret to getting influencers to participate is to make your “ask” easy. This step is make it or break it. KEY: Don’t make participants think. I get asked to contribute to many roundup efforts. While I have the best intentions, if it requires time to think and craft an answer, the chances of not getting done increase. Make your request short and fun. I discovered this with my marketing advice for college graduates. Everyone had something to say. Show respect for influencers and their time. Don’t just assume they’ll answer you. Just because you’re creating curated content doesn’t mean that you don’t need resources. Here’s where your creative contribution shines. KEY: Show the power of your participants’ contributions. Create related branding and formatting. Use consistent design elements and typeface. Give contributors their 15 seconds of fame. Tell their stories and show their photos. Use a copyeditor. Make sure that your contributors look their best. Even influencers sometimes need a little third party help. Like other forms of curated content, one size doesn’t fit all. KEY: Plan other curated and/or original content to support your curated epic content. Prepare related content. Odden has created related blog posts to support his ebooks using the same theme. He now asks participants up front if they’d like to be featured in a separate blog post. Reformat content for reuse. Minimize resource use by developing other content formats at the same time. As with any other content, optimize it for maximum results including search and social media. KEY: Incorporate your epic curated content into your social media and search plans. Use appropriate keywords. Include keywords from your other marketing plans. Format your content to facilitate readability. Encourage readers to consume the content. Add branded images. Don’t forget the visuals. 9. Develop a promotional plan. Don’t just hit publish and pray. KEY: Have an organized distribution plan. Spend the time to develop each aspect and channel of your promotion. Incorporate your owned, social media and paid distribution. Begin promoting your conference ebook before it’s published. Odden sent out multiple reminders. Simplify the process for influencers. The less your participants have to think the more likely they are to support your efforts. Odden now sends out a set of preformatted social shares. Invite readers to share. Get your target audience into the process. Incorporate ClickToTweet and other forms of sharing. KEY: Measure your results back to your initial goals. Incorporate appropriate calls-to-action. Don’t make influencers or readers think. Include trackable code. This can take a variety of different formats such as preformatted social media shares. Track a variety of metrics. Go for measures that contribute to sales and profitability. While you can follow the process outlined below to create curated conference ebooks, your results may not achieve Odden’s level success for the following 3 reasons. Odden is an established influencer. Part of the power of his ebooks is his personal reach including that of his highly regarded Top Rank blog. Odden has a strong network of high profile influencers with followings. He’s built these connections over time (not with money!!!) His contacts are the kings and queens of social media sound bites. The people involved share their involvement across social media and owned platforms. Odden is a speaker at some of the biggest events in the space. He has insider credibility. He is one of the influencers participating. Further these events have large lists and reach. While Odden has built a reputation as the go-to person for curated conference ebooks, you can borrow his process and adapt it to meet your specific needs. Remember, Odden’s secret sauce for creating epic curated content is to continually change and improve his content. 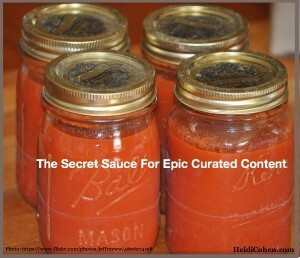 What types of epic curated content have you tried? What were your results? 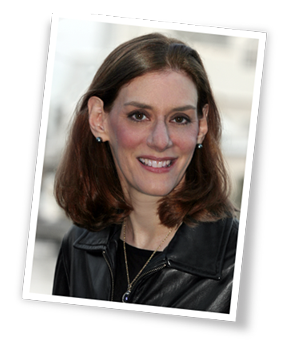 BTW–You may also like Sam Fiorella and Danny Brown’s book Influence Marketing . Tags curated conference ebook, Epic Curated Content, Lee Odden. Bookmark the permalink. Actually, the steps are all so relevant, that there’s no reason why one should skip any. Although, I have to admit, the challenge of a small content team is also that so many things together are sometimes hard to juggle with! Wow, thanks Heidi! Some great advice here.